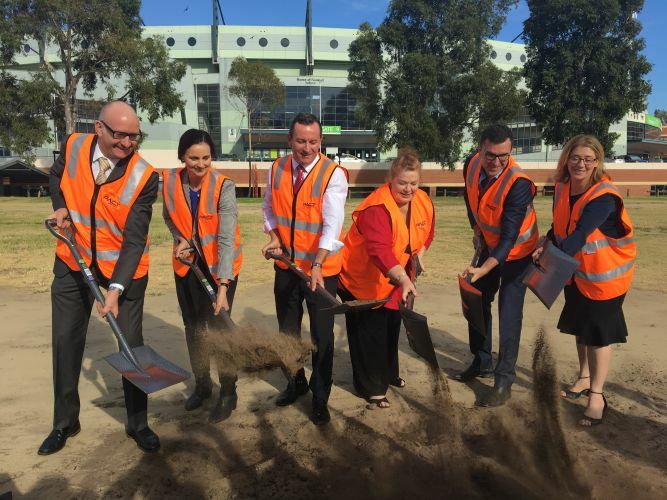 Mt Lawley MLA Simon Millman, Subiaco mayor Penny Taylor, Premier Mark McGowan, education minister Sue Ellery, Perth MLA John Carey and planning minister Rita Saffioti at the turning of the sod for the new Inner City College. CONSTRUCTION is starting today on the Inner City College in Subiaco. Works are beginning to realign the underground water pipes and services infrastructure as part of the $68 million stage one of the build. “What we’ve seen in the western suburbs and Mt Lawley is schools bursting at the seams,” Premier Mark McGowan said this morning. Parents can already view the local intake boundaries for the school , which is set to open for Year 7 students in 2020 and will be built to a 2000-student capacity. Education Minister Sue Ellery said today was an important milestone as the school started to take shape. “The foundation principal is expected to be appointed in coming months, and will be responsible for setting the direction and values of the school and its students,” she said. Subiaco Mayor Penny Taylor said she was excited about the future school. “With the loss of football, we’re looking forward to the redevelopments here,” she said. Some residents raised concerns at Subiaco council meetings in recent weeks regarding preservation of trees around the site ahead of construction, with Ms Ellery confirming 12 would be removed. “We are removing 12 to get access to what we need to do,” she said. Ms Ellery said some of the work had already been realigned to protect trees, and 37 would be planted on the site. Subiaco council last week adopted a tree preservation order over 23 trees in the area.